We're delighted to confirm the return of the benchmark compilation for the cream of the North’s digital agencies: the Prolific North Top 50 Digital Agencies 2017. Due for publication in the second week of March, this year's ranking will again provide the definitive guide to the North’s leading digital agencies spanning SEO and PPC, web, content, mobile and e-commerce. 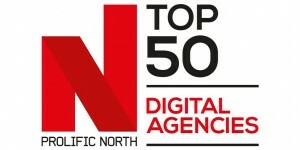 The Top 50 Digital Agencies initiative complements other market-defining Prolific North research features including the Top 50 PR Agencies and the Top 50 Integrated Agencies. Prolific North is delighted that search marketing agency Click Consult is to repeat its headline partnership of this initiative and we are also very pleased that the hosting company iomart (owner of previous sponsors Melbourne) is also again on board as the joint headline partner. And as with our other research-led rankings, Mustard Research is managing and leading the research underpinning the compilation and will ensure that the process is rigorous and the results entirely independent – unlike some rankings which are predicated on financial subscriptions and payments to be included. As with our other Top 50 rankings, the Prolific North Top 50 Digital Agencies will be anchored on financials including balance sheet/shareholder funds, turnover, pre-tax profit, headcount and growth; with the information and data sourced from the agencies themselves and confirmed with the financial reporting company fame BVD and data at Companies House. We also plan to include details on agency ownership this year. The deadline for submitting information to Mustard is Friday 17th February and agencies are requested to contact Hannah Barnsley at Mustard on Hannah.Barnsley@mustard-research.com as soon as possible with their information. Please note that as with all our rankings, we do not publish or reveal any financials: these are discussed privately between the companies and Mustard as we understand that the majority of companies in the ranking publish abbreviated accounts. Over 150 digital agencies submitted information last year and if any agency who didn’t but feels they ought to, please contact Hannah at Mustard. Please note that any agencies who feature in our Top 50 Integrated ranking cannot be included in the Digital ranking. We look forward to defining the North’s digital landscape once again in March.